"Mr Owen's service and sales was great. He had the best price and answered all my questions. The installation of the new unit was scheduled very fast. The day it was installed he arrived with his crew own time and ready to work. They were very professional and friendly. They have serviced my units for the last 3 years and it's great. I recommend him to friends and if you need any work done make him your first call." "Chris and crew did an outstanding job with my Trane installation on 12-16-15. They were very professional, hard working and concerned with quality. I am very pleased. Great Product! Great Job!" "Thanks so much for the timely response to our issue recently. We depend on you for all our HVAC needs and our trust is always rewarded with great service. In particular, Alan is a great technician who always does a thorough job." "Awesome company! Professional and courteous service. My husband supervised the installation of our new unit and the team didn't seem to mind one bit. We love our new unit and were very impressed with how the team worked together for the finished product. Can't say enough about Bill Owens Heating and Air and the team that gave us heat again. Thanks again." "Brian, your guys really rock. Everything looked perfect with the installation. My wife says the new Trane unit looks pretty but I love the performance. Tell your guys, thank you for a great job." "Mr Owens, I wanted to write and thank you and your company for the quick response. The attention to customer service and knowledgeable technicians is why I choose to use Bill Owens Heat & Air. I also tell anyone looking for a HVAC company to call yours." "I want to thank everyone who assisted in getting my central heating and air unit installed. Everyone was great and explained everything to me. I will definitely recommend your company to family and friends." "Brian: I am sorry I missed you yesterday, I was out of town on business. I got back about 1am this morning and am just now having a chance to look at everything. WOW! From what I can see, your crew did an outstanding job. You have exceeded my expectations by far with the installation, everything is as discussed, very neat, and very professional in appearance. I am extremely happy with how everything turned out. Thank you! It seems it has become harder and harder to find people who will do what they say they will do. I really did not know what to expect on this job since I had never worked with you before. I had a gut feeling that you were the right way to go. For once, my following my gut looks like the right decision. Finally, I would like to talk with you about redoing the duct work in my attic. I think your duct guy could make quick work of it and really improve the neatness and spacing in the attic. Thank you again. If you need any kind of reference, for a future bid, please let me know. My neighbor on the right has 4 Carrier units and my neighbor on the left needs two new units. I am going to show them your work." "Brian, everything about the service your company provided during the installation of our HVAC system was top notch. We're also very happy with the performance of the new unit." "Brian, just a short email to let you and your company know that we are very satisfied with the subject unit that was installed this summer. Your staff from sales, installation, clean up and follow up earn high marks for the professional way of doing business. We will be in touch with you when our second unit needs to be replaced. Furthermore, we will let our neighbors and friends know that we would recommend your company if they need HVAC assistance." "I could not! have been more pleased with the heating and air system you put in my house. Your staff was so easy to work with and totally trustworthy. You even made a service call at no cost when it was a problem caused by our granddaughter. Thank you so much and I could not recommend your company more." "Brian, just wanted to let you know how much I appreciate your honesty and workmanship. Everything work out exactly how you explained it to me, from choice of unit for my home to very professional installation. Other than a very quiet unit and even temperatures through out the upstairs of my home, I would never have known you had been in my house. Again thank you for the best of service and sorry for all the questions. If you ever need me as a reference please feel free to do so." "Bryan: As I mentioned on the phone, just wanted to tell you how much I appreciated the great job your men did. They were so thorough, courteous & efficient. They left a very nice looking installation job, cleaned up everything, thoughtful and very nice to work with. The unit seems to be operating perfectly and we are very pleased and happy. It is hard these days to find anyone that will do things right, especially the first time. Will definitely recommend you to friends & family." "Brian, I just Wanted to thank you for the tremendous job, installing the filtering systems on our two units. Your crew, headed by Shane, was highly competent, and the installations were very professionally done. They even cleaning up the mess so that there was no evidence that four men had been working here all day. As you know, we have been depending on your company for over thirty years and have always been pleased. Keep up the good work. Thanks again." "Brian — I just want to thank you and your company for coming to our “rescue” and providing our replacement ac/heating unit as quickly as you did last week. We have been extremely pleased with the performance of the Trane a/c over these several record-breaking temperature days! I suffer from respiratory problems as a result of cancer treatment and stem cell transplant, and had it not been for this equipment, there is no doubt in my mind I would be in a hospital right now dealing with severe respiratory problems!! I cannot begin to express my appreciation for your ability and the workers’ expertise in getting the air back on in our home! THANK YOU, THANK YOU from the bottom of my heart!" "Our a/c went out approximately 7:30 pm on Monday night, July 9. We called and left a message, and were promptly called back just minutes later. Your service man was here within the hour, and got our system fixed, and up and running in just a few minutes. Thank you so much for the quick and reasonable results." 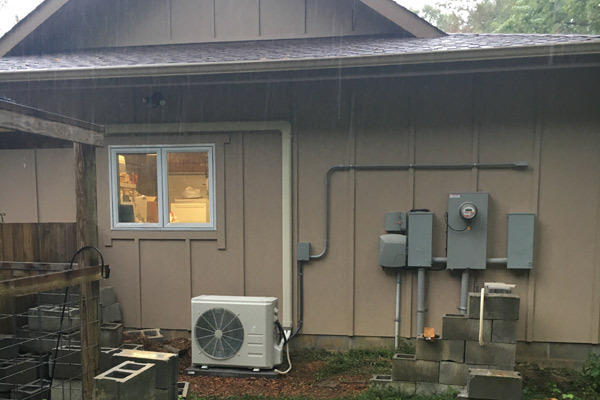 "Our thanks to Owens Heating and Air Conditioning for the great job your technicians did in replacing our compressor unit. It was a big undertaking and we appreciate your sending a team of men to get the job done within a day’s time. To my delight, they left the premises as clean, if not cleaner, than when they arrived — no small task in light of the removal and replacement of a number of components involving insulation, heating and air parts and valves of all sizes! Your professional attention to our heating and air needs through the years has always been first rate." "I contacted Bill Owens' Company and spoke to Brian regarding a need for a new unit for my home. He was very pleasant and willing to accommodate my needs for the problem at hand. I could not be happier and am very pleased I have made the phone call for this service. The installation workers were very courteous and cooperative. I called later and ask for some additional gravel to be placed in a particular area and it was done the next work day. What more could an individual ask for, nothing. Thank you again Brian and your crew for making this a pleasant endeavor. I will recommend anyone who is in need of your services to you." "Brian, just wanted to let you now how impressed I was with Bruce and Alan. As you know, the "fix" was difficult to pinpoint, but Bruce was determined to find the problem, and when Alan brought the new limit switch, the problem was solved. Your service people are professional. knowledgable, efficient, and courteous. We will continue to highly recommend your firm. Thanks for you prompt response to our call."